Genuine Piranha replacement tooling for Buffalo Machines Ironworkers. 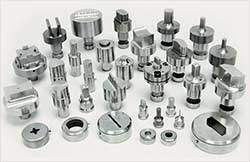 Standard sizes of tooling are in stock and available for same-day shipment. All standard shapes of non-stock tooling will ship within 48 hours, regardless of size. We know that fast delivery is important to you, and we have created manufacturing methods to provide you with the fastest delivery in the industry. NOTE: Dies with obround and rectangular holes are produced with the long dimension of shape parallel to flat unless other orientation is requested.